Seventy years of attacks on the right to unionize have left the union movement representing only 10 percent of workers. The investor class has concentrated its power and uses its power in an abusive way, not only against unions but also to create economic insecurity for workers. At the same time, workers, both union and nonunion, are mobilizing more aggressively and protesting a wide range of economic, racial and environmental issues. On this May Day, we reflect on the history of worker power and present lessons from our past to build power for the future. May Day Workers of the World Unite, Melbourne, Australia, in 2012. By Johan Fantenberg, Flickr. 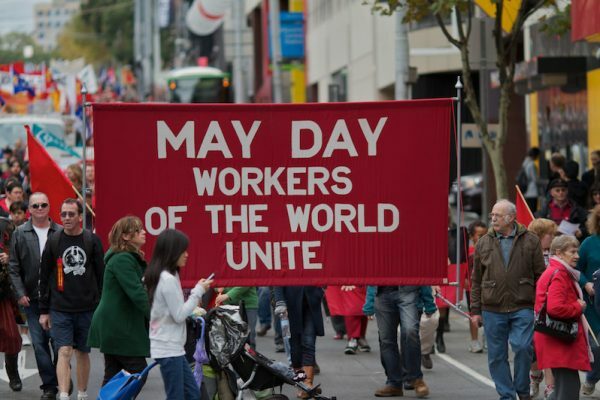 In most of the world, May Day is a day for workers to unite, but May Day is not recognized in the United States even though it originated here. On May 1, 1886, more than 300,000 workers in 13,000 businesses across the US walked off their jobs for the first May Day in history. It began in 1884, when the Federation of Organized Trades and Labor Unions proclaimed at their convention that workers themselves would institute the 8-hour day on May 1, 1886. In 1885 they called for protests and strikes to create the 8-hour work day. May Day was part of a revolt against abusive working conditions that caused deaths of workers, poverty wages, poor working conditions and long hours. May Day gained permanence because of the Haymarket rally which followed. On May 3, Chicago police and workers clashed at the McCormick Reaper Works during a strike where locked-out steelworkers were beaten as they picketed and two unarmed workers were killed. The next day a rally was held at Haymarket Square to protest the killing and wounding of workers by police. The rally was peaceful, attended by families with children and the mayor himself. As the crowd dispersed, police attacked. A bomb was thrown—no one to this day knows who threw it—and police fired indiscriminately into the crowd, killing several civilians and wounding forty. One officer was killed by the bomb and several more died from their own gunfire. A corrupt trial followed in August concluding with a biased jury convicting eight men, though only three of them were present at Haymarket and those three were in full view of all when the bombing occurred. Seven received a death sentence, the eighth was sentenced to 15 years, and in the end, four were hanged, one committed suicide and the remaining three were pardoned six years later. The trial shocked workers of the world and led to annual protests on May Day. 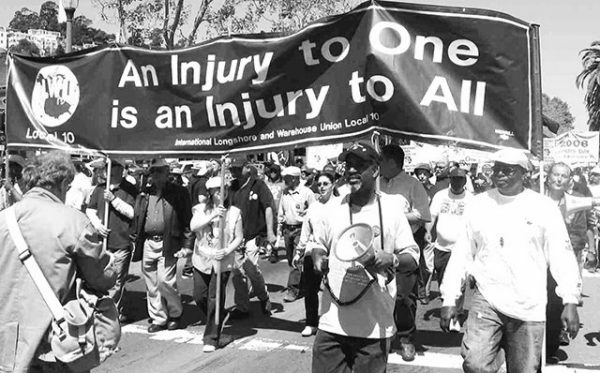 The unity of workers on May Day was feared by big business and government. That unity is shown by one of the founders of May Day, Lucy Parsons, who was of Mexican American, African American, and Native American Descent. Parsons, who was born into slavery, never ceased her work for racial, gender, and labor justice. Her partner was Albert Parsons, one of those convicted for Haymarket and hanged. Solidarity across races and issues frightens the power structure. In 1894 President Grover Cleveland severed May Day from its roots by establishing Labor Day on the first Monday in September, after pressure to create a holiday for workers following the Pullman strike. Labor Day was recognized by unions before May Day. The US tried to further wipe May Day from the public’s memory by President Dwight Eisenhower proclaiming “Law and Order Day” on May 1, 1958. Today, workers are in revolt, unions are under attack and the connections between workers’ rights and other issues are evident once again. Nicole Colson reports that activists on a range of issues, including racial and economic justice, immigrant rights, women’s rights, a new economy of worker-owners, transitioning to a clean energy economy with environmental and climate justice, and a world without war, are linking their struggles on May Day. There has been a rising tide of worker militancy for years. The ongoing Fight for $15 protests, helped raise the wages of 20 million workers and promoted their fight for a union. There are 64 million people working for less than $15 an hour. Last year there was also a massive 36-state strike involving 21,000 mobility workers. Worker strikes continued into 2018 with teacher strikes over salaries, healthcare, pensions and school funding. Teachers rejected a union order to return to work. Even though it included a 5 percent raise, it was not until the cost of healthcare was dealt with that the teachers declared success. Teachers showed they could fight and win and taught others some lessons on striking against a hostile government. The West Virginia strike inspired others, and is followed by strikes in Oklahoma, Kentucky, Colorado, and Arizona. These strikes may expand to other states, evidence of unrest has been seen in statesincluding New Jersey and Pennsylvania as well as Puerto Rico because courage is contagious. Graduate students have gone on strike, as have transit and UPS workers and low-wage workers. The causes include stagnant wages, spiraling healthcare costs, and inadequate pensions. They are engaged in a fight for basic necessities. In 2016, there wasn’t a single county or state in which someone earning the federal minimum wage could afford to rent a two-bedroom apartment at market rate. Last year on May Day, a mass mobilization of more than 100,000 immigrant workers walked off their jobs. This followed a February mobilization, a Day Without Immigrants. The Cosecha Movement has a long-term plan to build toward larger strikes and boycotts. There will be many worker revolts leading up to that day. The Poor People’s Campaign has taken on the issues of the movement for economic, racial, environmental justice and peace. Among their demands are federal and state living wage laws, a guaranteed annual income for all people, full employment, and the right to unionize. It will launch 40 days of actions beginning on Mother’s Day. Workers announced a massive wave of civil disobedience actions this spring on the 50th anniversary of the sanitation strike in Memphis, at a protest where they teamed up with the Poor People’s Campaign and the Movement for Black Lives. Thousands of workers walk off their jobs in cities across the country. The contradictions in the US economy have become severe. The wealth divide is extreme, three people have the wealth of half the population and one in five people have zero wealth or are in debt. The U.S. is ranked 35th out of 37 developed nations in poverty and inequality. According to a UN report, 19 million people live in deep poverty including one-quarter of all youth. Thirty years of economic growth have been stagnant for most people in the US. A racial prism shows the last 50 years have made racial inequality even wider, with current policies worsening the situation. In addition, 28 states have passed so-called “right to work” laws that undermine the ability of workers to organize. And, the Supreme Court in the Janus case, which is likely to be ruled on this June, is likely to undermine public unions. On top of domestic laws, capitalist globalization led by US transnational corporations has undermined workers, caused de-industrialization and destroyed the environment. Trade must be remade to serve the people and planet, not profits of the few. While this attack is happening, so is an increase in mobilizations, protests, and strikes. The total number of union members grew by 262,000 in 2017 and three-fourths of those were among workers aged 35 and under and 23% of new jobs for workers under 35 are unionized. With only 10 percent of workers in a union, there is massive room for growth at this time of economic insecurity. Solidarity across racial and economic divides is growing as all workers suffer from abuses of the all-powerful capitalist class. As those in power abuse their privilege, people are becoming more militant. We are seeing the blueprint for a new worker movement in the teacher strikes and Fight for $15. A movement of movements including labor, environmentalist, anti-corporate advocates, food reformers, healthcare advocates and more stopped the Trans-Pacific Partnership. This shows the potential of unified power. In recent strikes, workers have rejected proposals urged by their union and have pushed for more. Told to go back to work, they continued to strike. The future is not unions who serve to calm labor disputes, but unions who escalate a conflict. The future is more than re-legalizing unions and raising wages and benefits, it is building wealth in the population and creating structural changes to the economy. This requires a new economy where workers are owners, in worker cooperatives, so their labor builds power and wealth. Economic justice also requires a rewoven safety net that ensures the essentials of healthcare and housing, as well as non-corporatized public education, free college education, a federal job guarantee and a basic income for all. The escalation of militancy should not demand the solutions of the past but demand the new economy of the future. By building community wealth through democratized institutions, we will reduce the wealth divide and the influence of economic inequality over our lives. Correction: In describing Chris Hedges column on the gig economy we mis-identified a suicide victim as an Uber driver when he was a cab driver competing with Uber drivers. Margaret Flowers and Kevin Zeese are co-directors of Popular Resistance where this article was originally published.